I have made a Wonder Woman costume before, but this time I wanted to make a cape out of terry. That way, the cape would be big and dramatic, sure, but also, it would be warm and practical. 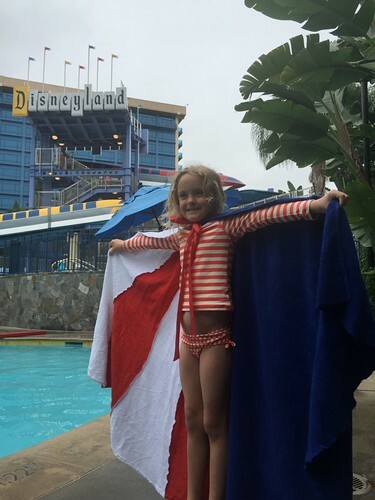 Even the tie at the neck would hold the cape/towel on the wet creature walking back from the pool. This was actually relatively easy, so I will share the math with you and you will be all set to make your own! 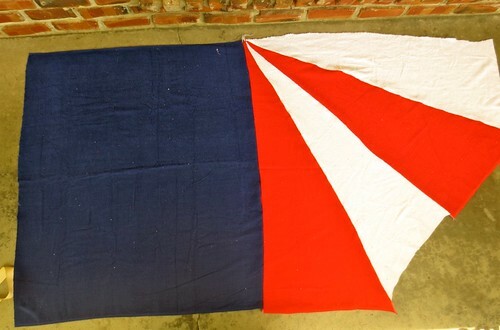 First, cut long triangles out of the red and the white fabric. To do this, fold the fabric from one corner across to the other corner the long way, so that you have two long triangles. Then cut along the fold. 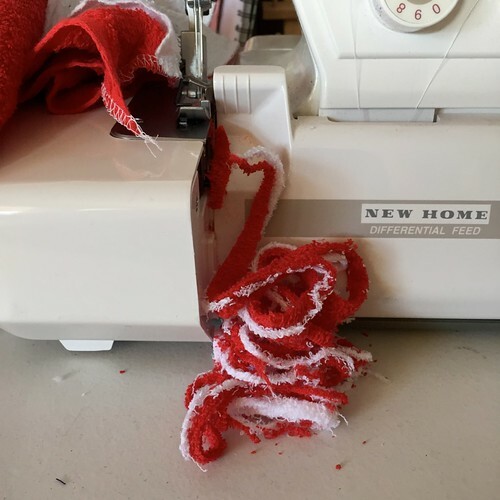 (You will do this twice, once for the red fabric and then for the white fabric. You will have 4 long scalene triangles). One end will be the point and the short side of the triangle will be the width of the fabric. My fabric was a generous 1/2 yard, so I started at the point and had two long sides of the triangle and the short side was 20″. If you had an exact 1/2 yard, it would have a short side of 18″. I used a serger. But this project does not require one. You could easily use a standard machine and the project would be great. Next, sew the triangles together, you want the point all at one end . One red and one white, then repeat. The nature of the cut will mean that you have kind of a saw tooth edge on one side. You will even that out. Next, sew the blue piece to the side of the stripes. Cut a round neck opening. Just fold the fabric into a pie piece shape and cut about 4″ for the “hole”. Hem the long sides. Carefully hem the bottom. This part is a tiny bit fiddlie because you want to hem the sections using the appropriate thread for the colors of terry. So you will be hemming two sections in white, change thread, two sections in red, change thread, and one big section in blue. I chose to trim the neck hold with red bias tape. And then sew the lovely ribbons to the sides of the neck. My last step was to add the stars. I thought about sewing them, but if you are sewing white stars onto dark blue fabric there are going to be tricky issues with trying to keep the thread invisible on both sides. So I chose to glue them down. I used e-6000 glue and a toothpick. 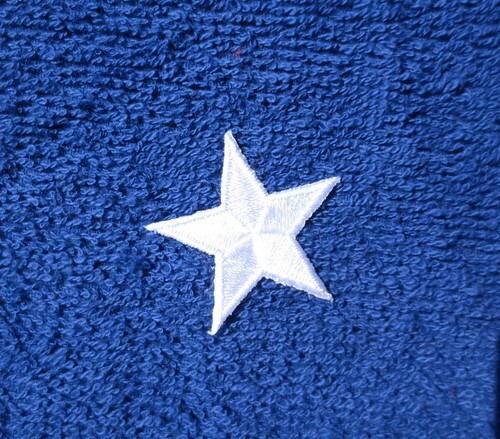 Take care to get a tiny bit of glue onto each of the points of the star. I laid them all out on a flat surface, and then picked up one at a time, applied the glue, and placed them back down. Technical Note: This cape was heavier than I had anticipated. The terry I used is quite thin, so I thought we were going to be okay, but when the cape was on the model and tied with the bow around her neck it was uncomfortably heavy. She liked the drama of it and the idea of it, but wearing it on the journey from the pool (wet) back to the hotel room was not in the cards. I will make two modifications to help address this issue. First, I will add some shoulder straps , like loops of elastic that will ride right at the arm pit and help hold the weight. Next, I will add some loops of elastic futher down the long edges for her wrists. Stay tuned for those mods. If you were making it for an older/heavier/taller kid, I think you would be fine. Also, if you do not want quite the “drama” that we achieved, just cut it shorter. That will take the weight right off. * A color note. The traditional Linda Carter Wonder Woman cape is, in fact, not this color pattern. 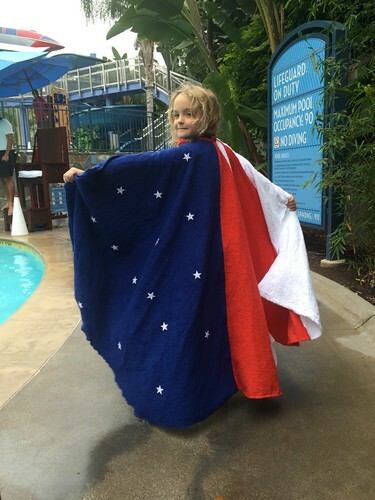 Her cape is Blue-White-Blue-White with 1/2 solid red. And the stars are sprinkled in a pattern that is heavy at the neck and lessor towards the floor. 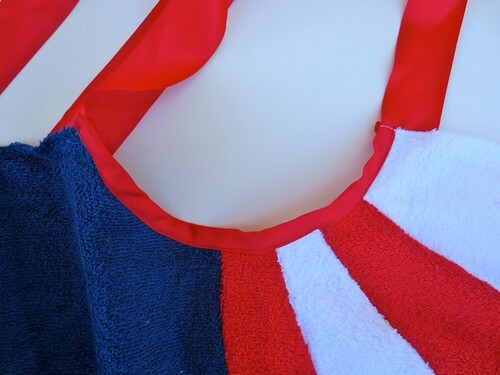 This cape draws it’s color scheme more directly from the flag, with red and white panels and then a blue background and white stars. I feel like it is still a great representation of the cape and you can plainly see that a super hero is wearing it. However, if you are a purist, or making this cape for Comicon, I would alter the fabric requirements accordingly. 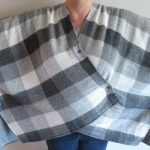 4 years ago by Susi in Crafty Mom , Needlecraft , Projects , Sewing , Sewing Projects | You can follow any responses to this entry through the RSS feed. You can leave a response, or trackback from your own site.